Whittlesey U14s, back (l to r), Carl Johnson, Wayne Holman, Jack White, Charles Lowe-Berry, George Gilbert, Sam Lindsey, Edward Wurr, Joel Anthony Smith, David Beckett, Mick Strowger, front, Calvin Fletcher, Lewis Beckett, Luke Toomey, Thomas Holman, Kristian Frank, Kieren Strowger, Finley Twigg. The cheering could be heard as far away as Peterborough as Whittlesey sealed the Junior Alliance Under 14 Division Two title last Sunday (May 15). A 1-0 win over Deeping Amber, along with a 4-2 defeat for sole title rivals March Soccer School at home to Glinton & Northborough Black, clinched top spot. Kristian Frank scored the only goal of the game for a team who have pretty much been together since they were five years of age. 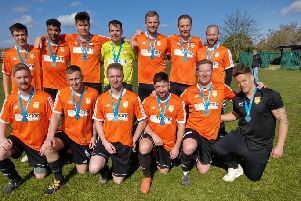 And the latest success continued a dramatic turnaround in fortunes for Whittlesey who were playing in Division Four when current boss David Beckett took charge four years ago. Whittlesey won promotion that season as champions and they were then runners-up in Division Three the following season. Beckett’s boys finished third in Division Two last season. “The season has been incredibly tight,” Beckett stated. “But finishing top was something I knew we were capable of and I’m delighted for the boys that we will be a top league side next season. “It’s more like a group of friends playing football. They all enjoy it which is what it should always be about. “Yes, it’s competitive and of course we all want to win, but it’s also about enjoying every game, which we do. We are also lucky we have a great group of parents who are extremely supportive of the boys as well as a supportive club chairman in Graham Sharman. Beckett is well supported by coaches Wayne Holman, Mick Strowger and Carl Johnson. Glinton’s scorers at March were Sandro Ferreira, Andrew Irvine, Dylan McShane and Joseph O’Callaghan. Jordan Palmby and Alex Redhead scored for March. That result meant Whittlesey finished five points clear at the top. Werrington finished their season with a 4-2 win over Bourne Claret thanks to goals from Spencer Haskins (2), Oliver Dyson and Aaron Peat. And Phoenix secured a top five finish with a 5-3 win over Hungate Green. Their scorers were Willam FDavell (2), Fowler Edwards, Diogo Monteiro and Callum Wise.